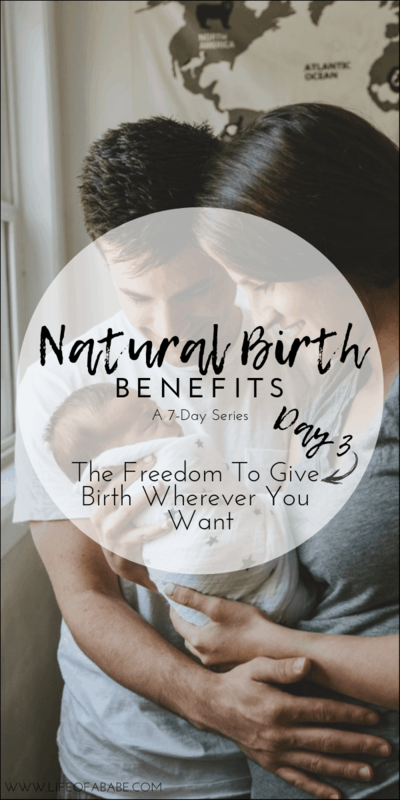 Another benefit of having a natural birth is having the ability to birth anywhere you want. Your birth setting can have a major impact on your natural birth experience and even your birth outcome. Currently, most births still do take place within a hospital setting but I believe that that’s due to the misconception that hospitals are the safest place for all women to give birth. The fact is that they are not safe for all women and pregnancies. Births are over-medicalized, women are often not supported to have physiologic, and interventions are performed way too often. If you are healthy and are having a low-risk pregnancy, the hospital may not be the best place for you to have your natural birth. Below is a breakdown of the top 3 birth locations and how they can impact your natural birth experience. 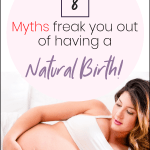 Although it is very much possible to have a natural birth in a hospital setting (I’ve had 2! ), it is often more challenging to do so than in other birth locations such as birth centers or your own home. This is why I’ve made the decision to birth my future children outside of the hospital. Birthing rooms in hospitals are generally, cold, clinical, and filled with machines, which are not conducive to a positive natural birth experience. Research shows that women who have planned hospital births, are at a higher risk of experiencing medical interventions, medical assistance, and negative health outcomes than women who have planned homebirths. The current evidence also shows that women who give birth at home often experience a higher satisfaction with the childbirth experience than women who give birth in a hospital. If you’re planning to have an unmedicated birth but have to do so in a hospital, that’s ok! You’ll just have to make sure you have all the support you need; consider hiring a doula, make sure you get familiar with natural pain coping techniques, and get familiar with these 8 practical tips for a successful natural birth in a hospital. If you do not wish to give birth at home and you also want to avoid having a hospital birth, you may want to look into giving birth in a birth center. The atmosphere of a birthing suite in a birth center often mimics that of a home. So you can still have that warm, private, and comfortable atmosphere which is one of the things that helps women cope with the pain of labor naturally. 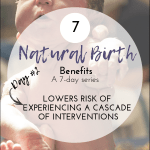 Birth centers may also help increase your chances of having a “successful” natural birth, in that they are more familiar with natural pain relief options such as acupressure and hydrotherapy. Also, generally speaking giving birth in a birth center is cheaper than giving birth in a hospital where you would be more likely to experience a longer stay. Having a homebirth especially when you’ve never had one before can be a little intimidating. So, a birth center may be the perfect alternative to a hospital birth. Contrary to public perception, the home is one of the safest places to have a baby. If you are healthy and your pregnancy is low-risk, and you’re planning on having a natural birth, it is not necessary or even preferable to give birth in a hospital. It is generally easier to endure and enjoy the process of labor at home because you are in familiar surroundings and can labor without constant interruption. In a homebirth, you have more comfort, privacy, and the access you need to things you may want or need to help you cope with labor. Research shows that women who have planned hospital births, are at a higher risk of experiencing medical interventions, medical assistance, and negative health outcomes than women who have planned homebirths. The current evidence also shows that women who give birth at home often experience a higher satisfaction with the childbirth experience than women who give birth in a hospital. Research also shows that the health outcomes of babies are no different compared with planning a hospital birth. Of course there are other factors to consider when planning for a homebirth, such as the distance of the home in relation to the hospital in case there is a need for an emergency transfer, but this is something that you can discuss and plan with the guidance of your midwife. At the end of the day, what matters most is you feeling safe and comfortable with your choice of birth location. I didn’t know about birthing centers, how do you find them? I was always curious about home births. I always wondered what happens if something was wrong with the baby what happens since you’re not at the hospital? That was always my fear and why I had all my babies at the hospital. I had to have c-sections with all my kids, and one pregnancy I had twins, so I don’t think it would have been able to be an option. Home births did always interest me though. Hi Maria! Great questions. You can simply Google “birth centers in [enter your city/town]” to see if there are any in your area. In regards to hospital transfer when it comes to home births, most transfer are for non-urgent reasons. Only a very small # of transfer occur for actual emergencies. In those cases, transfers are done via ambulance. Most healthy people with healthy pregnancies who plan to have a home birth actually have ones. In most cases emergency transfers are not the norm. Great birthing options. Would have been great if I was aware of them a few years ago. I love this! I had a natural birth in the hospital but all of the staff members were very supportive! I wish I’d considered a birth center for my kids! I had all 3 in a hospital and the whole labor process was just long and painful. I didn’t get to utilize the whirlpool tub or any of the other things they had advertised to make labor easier. Thanks for the great tips, I hope they are super useful to someone else! Excellent tips! I have a pregnant friend who wants to give birth naturally! I’m going to forward this to her.